A Most Unusual 9/9 Game: Now with too many screenshots. Complete Visibility. Two players - I'm Normal, my friend is Helper. Well, this should be interesting. AI 1 - Green: Onyx Star has a Plasma Eye, a Shredder Drone post, and a Wrath Lance. It also has an Alarm, a Counter Spy, two Ion IIs, an Ion III, an Ion V, an Orbital Mass Driver, and a Warhead Interceptor. AI 1 is a Mine Enthusiast / Experimentalist. 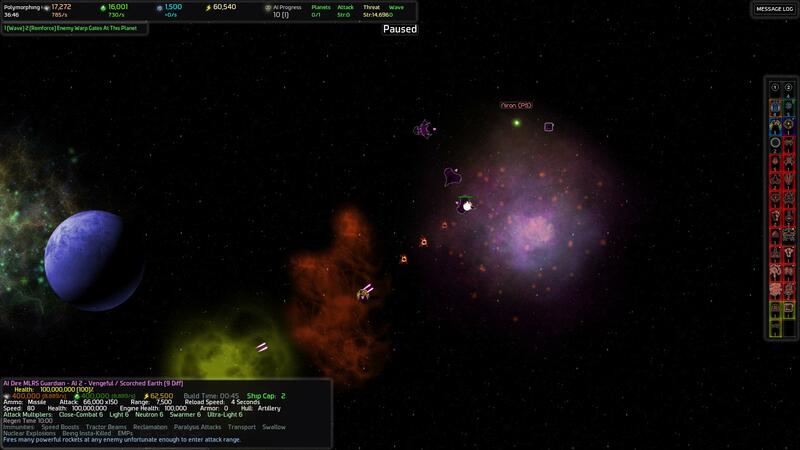 AI 2 - Purple: Diamond Star has a Translocator Eye, a Core Raid Engine, and a Wrath Lance. It also happens to have two Ion IIs, an Ion V, an OMD, and a Warhead Interceptor. Do these AIs think they are Peacemakers, or is that normal for 9/9? AI 2 is a Vengeful / Scorched Earth. Guess what I'm not killing. Looks like this'll be a fairly standard game of newbies getting murdered. So, to balance this out, we have a special rule. My friend will be controlling a H/K MkV. If it dies, it shall be downgraded to a MkIV, then a MkIII, and so on. If it dies as a MkI, he shall get some guardians instead. Let's hope he's not...overly aggressive. Destroying humanity, one command station at a time. I guess that's the "can't touch this" AI. it's normal for 9/9. 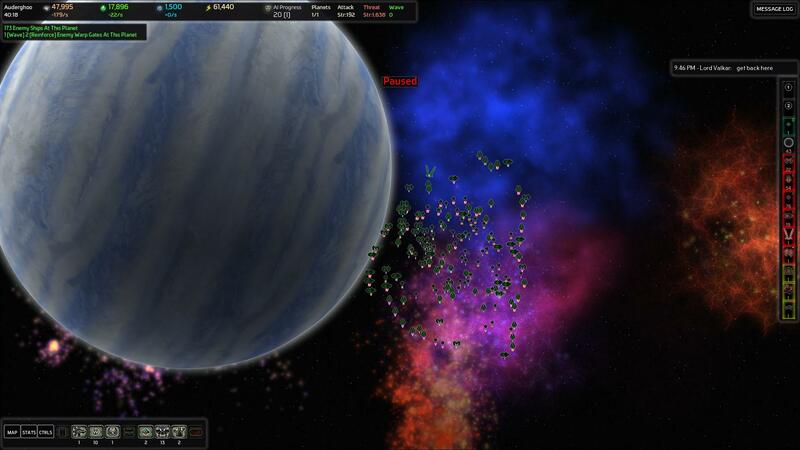 Homeworlds tend to have a lot of ion cannon-like structures. Tell your friend to be very careful with that first H/K. It's gonna be a huge help against the homeworlds. I'd go for Diamond Star first. The lower your AIP when you take out that Core Raid Engine, the better. 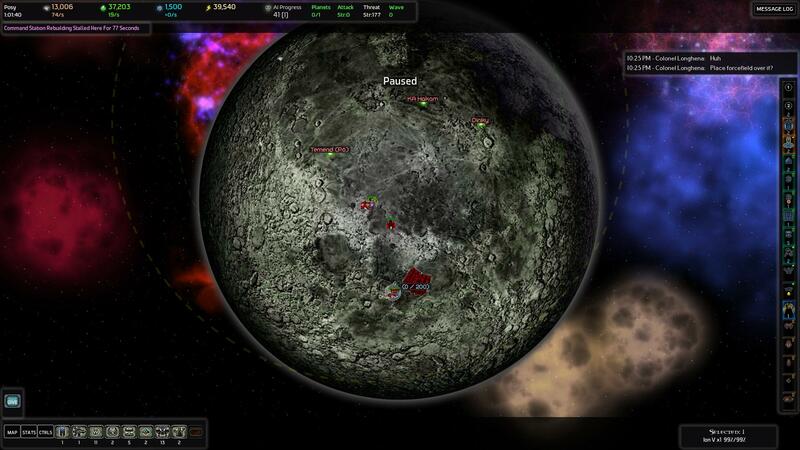 btw, is it just me or does AI 2 has a lot more planets than AI 1? Talk about terrible RNG luck. man, whoever got you control of that H/K should get a medal. ... If they survived, that is. A programmer had a problem. She thought to herself, "I know, I'll solve it with threads!". has Now problems. two she. If you learn well the Way Of The Cheese, that ship will carry you far. Two players - I'm Normal, my friend is HelperHunter. Do these AIs think they are Peacemakers, or is that normal for 9/9? The ion/omd/w-int combo is standard for core planets, and I think also for homeworlds. Peacemaker is where they do it everywhere. AI 2 is a Vengeful / Scorched Earth. Good night! Talk about kicking someone while they're down. Or is that kicking someone while you're down? So, to balance this out, we have a special rule. My friend will be controlling a H/K MkV. Ingenious, I really look forward to hearing how that turns out. My guess is that said H/K would have a fighting chance against everything else in the galaxy at the start of the game, probably excluding the wrath lances. Are the H/Ks immune to repairs? If so, do the auto regen? In any case, a Mk. V H/K could probably make a beeline to all "important" worlds, nueter them, go to the core worlds, neuter those too, and probably still have health left over, provided he limits his exposure to OMDs, fortresses, and anti-starship guard posts. I start by going with my usual starting units - 10 additional science Is, 10 total stardocks, 3 total starship constructors. Hunter goes to neuter Hot Wind and Auderghoo. I unlock Protector IIs and start building them. Counter everything! 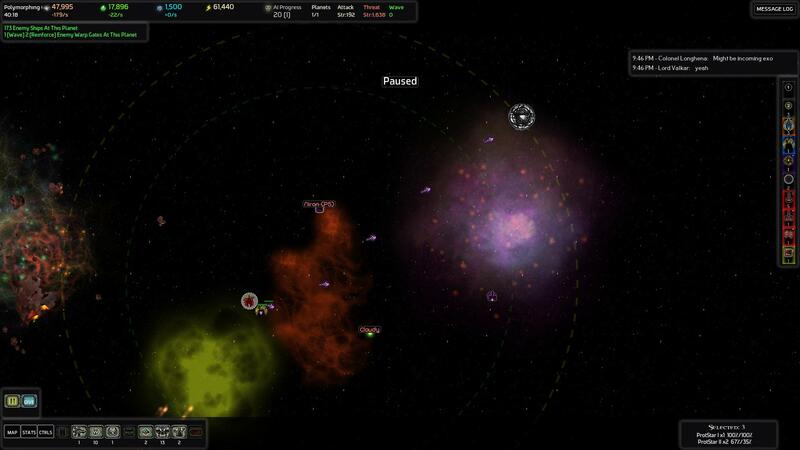 I then build defenses on the homeworld. Nothing too substantial for now, tachydrone on each wormhole [if they have cloak, I don't think so], mines, and a cap of sniper turrets. 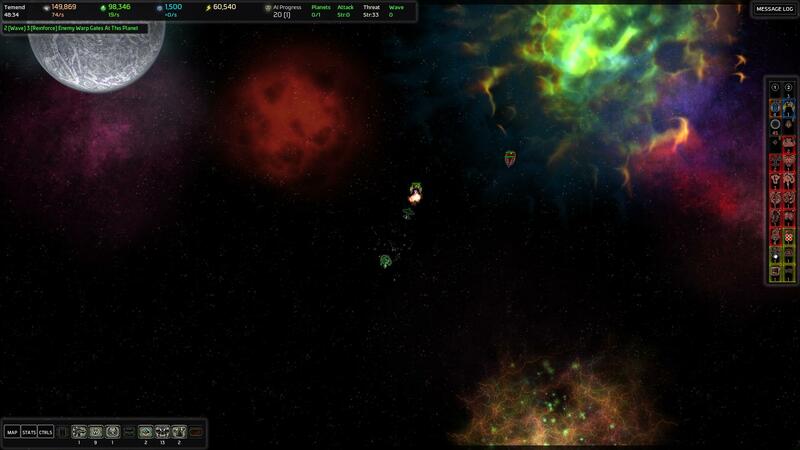 8:30 first wave declared, 97 Missile Frigates and 2 starships. This should be easy. Hunter might need to pull back if they are plasma siege or something, but whatever. 9:50 Apparently the Vengeful AI isn't happy, incoming Mk5 ships. They get murdered by mines. Wave hits at about the same time, with 2 Leech starships and a flagship. Hunter takes care of them all. 12:34 second wave declared. 181 laser gatlings, 3 starships. Vengeful AI is still not happy, but I'm not sure what it's doing. They all get sniped to death as they leave the grav well. I wonder if the Hunter wants to buy something? Trader shows up on homeworld shortly thereafter. ZPG purchased. As we kill the first data center [Only -10 AIP? I thought it was -20? Or is that just 9/9? ], I notice a Dire Guardian Lair on the planet adjacent...and the Dyson. And it's AI 2. Wonderful. Why do Widow Guardians look like planes? Well, the Dyson planet has a Radar Jammer mk2 on it, too. Looks like a good place to stop, for now. yup it's true. Data centers give -20 AIP on dif 7 and below, -15 AIP on dif 8 (not sure about that) and -10 AIP on dif 9 or up ( I think). Making dif 9 even harder than it already was. And I thought all mk V ships were immune to aoe or mines? Or was that just missile frigs? Anything that's mine-immune in those vengeful spawns got sniped. They are not immune to repair, and only cost 50,000 of each, at 120/s. So easy to repair. Also why is my Insert Quote button not working? So, we destroy the Dire Guardian Lair. Two MLRS, one Gravity. All 3 are eliminated with ease, but one protector starship dies. A few moments later, the Dyson is freed. Incoming vengeful AI. Incidentally, Radar Jammer Mk2 doesn't list "Nuclear Explosions" under its' immunities, despite being Scorched Earth'd. Or was that Nuclear Command that kills ships? Well, a chunk of that went off into nowhere again. Sniper bait. With the Dyson freed, it'll keep the nearby planets on alert, sucking up reinforcements and taking care of them. Next target: Posy! Objects of note: An Ion Mk3 and an Ion Mk5. Why so many Mk5 ions? En-route, we have a battle between planes Widow Guardians and the Hunter. The Widow Guardians were severely outmatched. The very notion of then winning is just plane wrong. A wave is declared, missile frigates and some starships. A Plasma Siege brings some concern, as a while ago apparently one got close enough and started hitting my home command, but it's flattened. 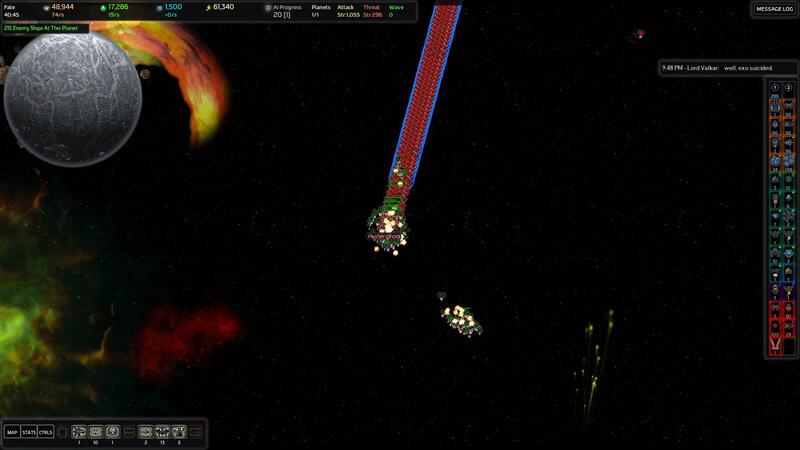 A second wave is declared immediately after, 242 laser gatlings and 2 starships. This'll be easy. I put a cap of needler turrets down. Apparently an arachnid guard post killed two protector starships. Oh well, the H/K is Artillery Immune...and Mass Driver immune. The wave hits, two plasma siege starships and a leech starship. Posy is clear. AIP 41. I send a colony ship, and 5 science I's, in a transport. And then I realize Science I's are not ion-proof. And then, as I'm building the command station, the Hunter goes to neuter another planet, and then the AI sends some ships in, heavily damages the Ion III, and kills the command station. I go to clean up some threat with my two Riots, but a planetary armor inhibitor shuts their shields down, and missile frigates and mines kill one. After the Hunter forgot about vengeful spawns, I nearly lose my home command. ...the other has the Hunter between me and it. A vengeful spawn made a Raid Starship, killed an energy collector, causing a brownout, killing my Ion V.
The other half of the vengeful spawn was on my homeworld, when all my forcefields shut down. 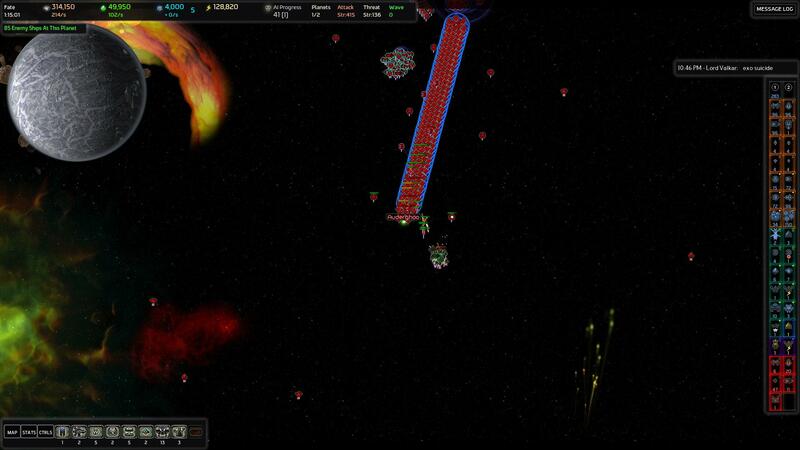 ...then the ZPG goes up, the forcefields go back online, and the AI's assault is annihilated. My friend wants Dire Guardians to be buffed. I'll shout at him after he puts the H/K away. Bearing in mind that Dires are essentially Mark Fifty guardians, what do you want? Presumably he wants Mark One Hundred guardians. I tested a Mothership VS H/K Mk5. The H/K got down to half health, but still won. At what range did the engagement begin? I suspect the Mothership would win starting from maximum range.